Plastic particles found in the Pyrenees Mountains suggest they are now travelling in the air. 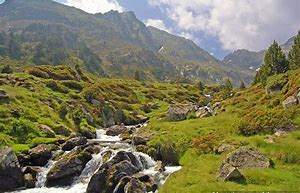 Scientists from the Ecolab in France and the University of Strathclyde in Scotland have found them in the air in a very remote area of the Pyrenees Mountain between France and Spain. It suggests that plastic is not just polluting the ocean but also the air we breathe. Microplastics are very small pieces of plastic waste, produced when plastics breakdown. Many of the fragments found by the scientists were small enough to be inhaled. Very few people live in the remote mountainous area that they focused on indicating that the microplastics blew in with the wind from a populated area 60 miles away. Over a five month period, the scientists found 365 pieces of microplastics per square meter on a daily basis. They believe the debris is from single plastics such as water bottles. The scientists say their findings are alarming in such a pristine setting and a global approach is needed for single plastic use.